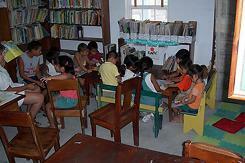 The San Pedro Library offers reading materials for adults, young adults, and children of all ages. 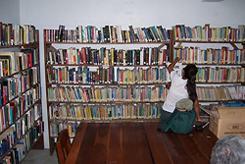 There is a large collection of adult fiction and a growing selection of adult non-fiction. There are fiction and non-fiction books for young adults. The Library is committed to providing the young children of San Pedro with access to a rich selection of books and an atmosphere that encourages children to explore the world of books. There is a Senior Librarian available to assist adults and children with reference questions and access to the reference collection. 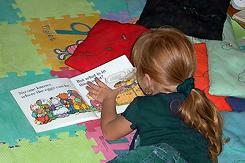 Every summer the San Pedro Library offers a reading program for children. The program provides children the opportunity to explore the world of books, improve their reading skills, and enjoy stories read by volunteers. During the school year, the Library offers a reading tutor program that provides children with one-on-one tutoring in reading. The Library cooperates with the San Pedro schools to ensure that the children with the greatest need are provided first chance at enrolling in the tutoring program. 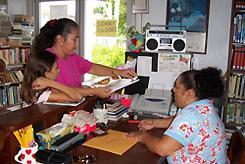 Volunteers who have experience working with young children staff the program. This service is provided free of charge. 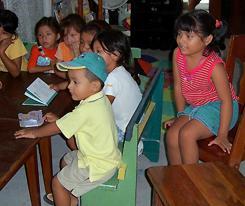 The San Pedro Library provides children access to computers and the Internet. These systems are dedicated for use by children only. 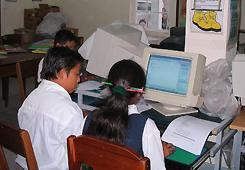 Throughout the school year, the Library offers computer instruction for children. The classes include basic computer use, Microsoft Office software, and Internet use. The computer systems, software, and printer were a gift to the Library from Captain Morgan’s Retreat, Ambergris Caye. Library Home | What we do | Achievements | How we do it | How you can help | Email us!